Summer is traditionally the time when popular musical acts hit the tour circuit, whether it's the hottest pop sensation or a classic rock favorite. It's also the time when the outdoor venues (or "sheds" in industry parlance) dust off and offer concert-goers the experience of an outdoor concert. But San Diego is different when it comes to the outdoor concert season; the reason being that having such perfect weather makes our "summer" concert season much longer than elsewhere in the country. In fact, San Diego's outdoor concert season actually runs from mid-spring well into early fall. And with some of the best outdoor concert venues anywhere to go along with the warm weather, local concert promoters take full advantage of staging the most attractive acts. In fact, the most difficult thing for many concert-goers this time of the year is deciding which shows at which venues to attend. With most concert tickets in the $30-50 range (and many more approaching $100 bucks or more a pop), it does become a bit daunting to the wallet. Click here to see an updated monthly listing of concerts in San Diego. It's a beautiful setting (alongside the water in Shelter Island), and with only 1,300 seats, Humphrey's provides an intimate setting for its summer concert series. Pros: great setting on the waterfront. Cons: Aisles and seats are so tight there is no room to move. Bar noise is aggravating. Tidbit: If you have a boat, you can join other freeloaders in the marina and watch concerts for free. The OAT is my favorite outdoor venue. 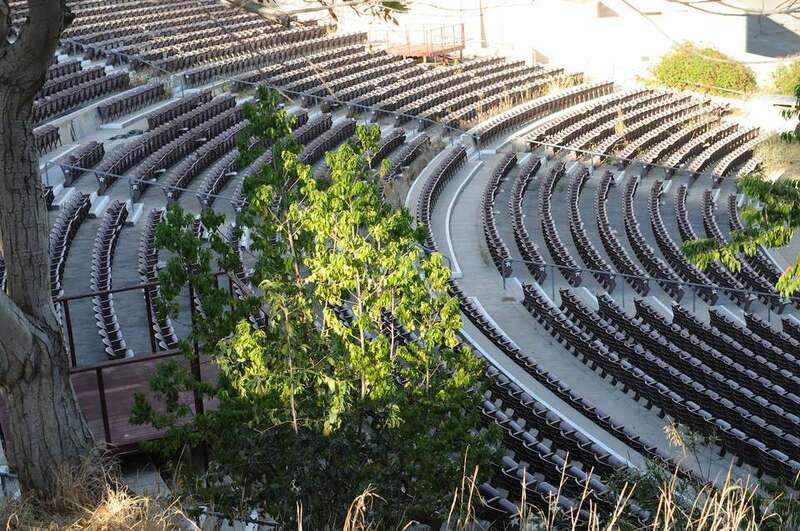 Located on the SDSU campus, this 4,600-seat amphitheatre offers great sight lines and good sound. It is steeply raked, be careful walking the aisles. Emerging acts on summer tours are often booked here (Madonna played here in the '80s). Pros: Cool campus setting. Cons: Cheap seats at the top are concrete (ouch!). Beacause of the competition from Humphrey's, Coors, and Viejas, not many shows are booked here anymore. Tidbit: If you hang outside early enough, you can listen to the band sound checks. This giant "shed," located in Chula Vista has attracted some impressive musical artists and groups to San Diego. No longer do mega-acts pass up San Diego for sheds up north. The arena has gently sloping sight lines with room for 20,000 (half on the general admission lawn). Pros: Roomy facility, lots of leg room. Cons: Traffic access is poor and the lower part of the bowl isn't raked quite enough apart if you're behind a tall person. Tidbit: Large video screens help your viewing, expect long waits to and from the venue. This might be the oddest outdoor concert venue. Not because the Viejas Casino doesn't do things top-notch (they do), but the "Park" in this instance is the lawn area of the casino's outlet mall across from the San Diego casino. So, it doesn't lend much for ambiance when you're sitting among storefronts for retailers. Pros: Always a good lineup of artists, nice and warm in the summer (it's in Alpine) and the casino is across the street. Cons: You can't get past the fact you're in a shopping mall, seating can be obstructed on the wings and...the casino is across the street. Tidbit: Parking is plentiful; if you buy your tickets in advance at the casino, you can save on some of the usual service charges. Located just behind the San Diego Convention Center, this venue is also where they stage the Summer Pops concerts. The venue itself is unadorned (bleachers and folding chairs), but it's outdoors right on the picturesque waterfront. Pros: It's on the waterfront. Cons: It can get chilly on the water, parking in the area is limited and you usually have to take a shuttle to the venue. Tidbit: Bring a jacket and allow time for shuttle transport. Concerts here are usually during the summer San Diego County Fair or at the horse racing venue. Pros: The fair has been booking more appealing artists to attract fairgoers and many shows are included with fair admission. Cons: It's a race track, so sightlines and angles are horrible, as is the sound. Many of the big name shows during the fair are a separate admission. Tidbit: For the free shows, get in line early for entrance to get the best seating and sight lines. This amphitheater in Balboa Park is little used for concerts these days (though I have seen Cheap Trick and Roy Orbison there), especially with the competition of Coors and Humphrey's. It's now mostly used for Starlight Opera musicals. Pros: It's in Balboa Park. Cons: It's directly under the airline's flight path to Lindbergh Field, though with loud rock concerts, that doesn't really matter. Tidbit: During Starlight musicals, the cast literally freezes in place when a jet makes a landing approach.